8.7.6.1 Solvent Selection. The GSK Solvent Selection Guide (SSG) was created in response to initial lifecycle inventory/assessment work that clearly showed solvents make a considerable contribution to the overall lifecycle environmental impact of GSK. 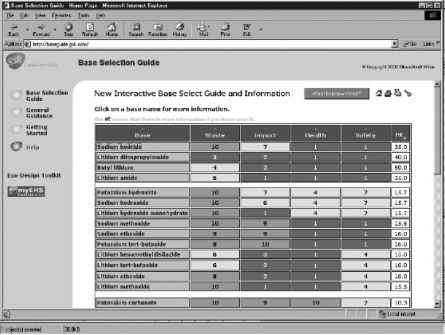 The SSG, containing detailed information on 45 solvents, was launched in 1998 as a paper/EXCEL based version (Curzons et al., 1999) and was rapidly followed by a corporate intranet site. The Guide was unique in combining a systematic assessment, review and ranking of solvents from an Environment, Health and Safety perspective and presenting information in a simple, easy to use and understand format. 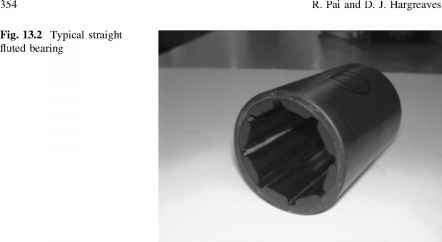 Underpinning the guide was a comprehensive evaluation of solvents from first principles. By the time of the merger, continuing work on solvents and on the lifecycle of solvents afforded the opportunity to revise the guide. 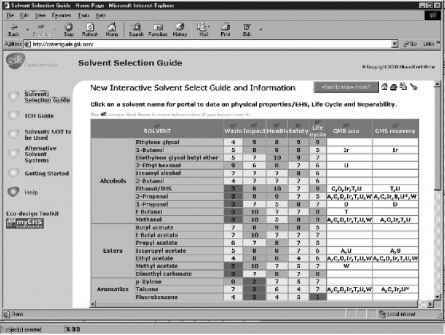 The new guide contains a revised set of solvents (some solvents whose performance was not acceptable were removed), a revised health scoring methodology that incorporates recent advances in harmonizing risk phrases, and detailed lifecycle information (Jimenez-Gonzalez et al., 2003b) for each solvent. The original scoring methodology was also revised to include a solvent lifecycle score for each solvent. Figure 8.26. The GSK Solvent Selection Guide. • Detailed information on selected physical properties, safety, health, and environmental issues. Future work on solvents is focusing on the interaction of solvents and chemistry and greater emphasis on replacement solvents. 8.7.6.2 Base Selection. Following on the success of the solvent selection guide and in response to specific requests from a number of synthetic chemists, a similar exercise was undertaken to evaluate chemical bases. Bases are used extensively in many synthetic chemical procedures and are often used in stoichiometric quantities. Given their use and properties, their EHS performance is understandably of great concern. Figure 8.27. The GSK Base Selection Guide. the BSG contains a ranking of 42 chemical bases according to their environmental waste profile, environmental impact, safety profile, and health impact. As with the SSG, the user is directed to a readily recognizable summary table format that functions as a departure point for more detailed information on each base. In addition, there is general guidance on the use of bases. This site was updated and revised in late 2002. 8.7.6.3 Green Packaging Guide. GSK has worked since the early 1990s to influence packaging decisions, especially in its Consumer Healthcare business. Since the mid-1990s, GSK has had a corporate intranet site dedicated to improving the EHS and lifecycle performance of its packaging. An extensively revised site was launched in 1998, and again, in 2003. An additional major enhancement to the site in 2003 was the incorporation of a new tool known as WRAP - Wizard for the Assessment of Packaging (Duncan and Curzons, 2004). WRAP is an interactive tool that allows users to assess the greenness of their packaging, benchmark against different packaging choices, and provides guidance on improving packaging performance. General guidance for the Pharmaceuticals and Consumer Healthcare businesses in the intranet site includes a business process for the selection of packaging, a module on packaging legislation throughout the world, and a module describing new packaging materials. • New disease targets. For example, GSK already has a significant investment in the development of medicines for diseases of the developing world. These initiatives include the development of vaccines, antidiarrheals, antimicrobials, and antimalarials. There remains a plethora of diseases afflicting huge segments of the worlds' population that have not been addressed, and there are clear opportunities for companies that are able to overcome equally clear challenges. • Green building design. There are significant opportunities to reduce our overall environmental footprint through building designs that include consideration of materials, energy use, location, community impact, and so on. • Changes in sales and marketing. There are currently very large sales and marketing forces traveling throughout huge areas to educate and inform physicians about GSK products. Opportunities for accomplishing the same tasks through advanced telecommunications and Internet applications hold some promise for reducing the impact while maintaining or increasing the effectiveness of the sales force. These same techniques hold additional promise for reaching currently unreached or underserved people groups throughout the world. • Targeted API delivery. Advances in genomics and proteomics, nanotechnol-ogy, and other areas hold significant promise for delivering the right drug in the right amount at the right time as opposed to the heavy-hammer (particularly in oncology), "one-size-fits-all" approach of modern pharmaceutics. This opportunity is, however, confronted by significant challenges and is clearly a long-term opportunity. • Healthcare infrastructure. In many parts of the world, there is a very poor or nonexistent healthcare infrastructure. This exacerbates current initiatives for treating diseases such as HIV and prevents the development of additional medicines. A lack of healthcare infrastructure usually is highly correlated with political instability, and this makes the conduct of normal business very difficult. • Patent protection. Fair patent laws for medicines and the processes used to make them need to be harmonized throughout the world. Adequate patent protection inhibits the discovery and development of new drugs, particularly in those parts of the world that are currently underserved. • Technology. Significant effort must be undertaken to develop more flexible, efficient, and effective processes to make APIs. A paradigmatic shift is required for the industry to move from batch to continuous processing, but this must be accompanied by a mechanism that makes the switch economically viable. There is significant capital investment in place for a typical multipurpose chemical plant that is fully functional and will continue to be so. This is also locked in place by regulatory agencies with changes extremely difficult to implement. • Chemistry. Efforts to demonstrate sustainable chemical synthesis must be undertaken at a scale that is meaningful to the industry. • Materials. The building blocks for APIs are currently derived almost exclusively from petrochemical sources. New materials, including biologically derived materials, must be developed.